Experts agree that the impact of natural hazards such as earthquakes, floods and cyclones can be reduced by making strategic choices. How we build our homes, how we manage the land and the environment, and how we prepare for adverse events, are some of the factors that can make a difference when a disaster strikes. Scientific research, as well as policy expertise and communications skills, are key to inform and guide governments, societies and communities to better prepare for disasters. PARR fellows have the unique opportunity to receive training, mentorship, resources, and access to regional networks to advance their research, communication, and practical skills, in order to increase resilience in their communities, cities, and countries. 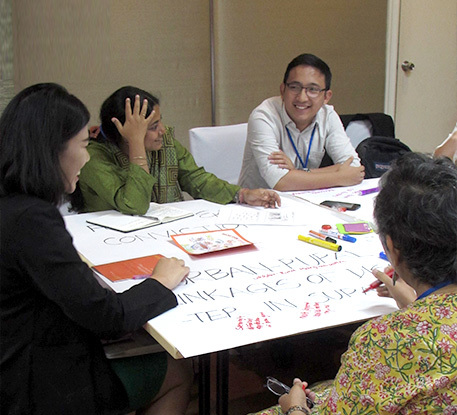 Since 2014, PARR has trained 22 fellows, and has developed an active Asia-Pacific network of urban and disaster risk reduction researchers, policymakers, and practitioners. Fellows are selected from Asia-Pacific institutions and participate in a yearlong fellowship, including an immersive one- to three-month stay at a host institution in Asia. While in residency, fellows collaborate with both host institution mentors and other fellows to conduct research on a variety of topics under the umbrella of urban disaster risk reduction. Once fellows return to their home institutions, they may apply for additional funding under PARR to carry out independent research projects, which will result in the production of manuscripts for submission to peer-reviewed journals, policy-briefs and workshops for local government, and/or communications materials for enhancing community resilience. In addition, all fellows participate in a series of professional development webinars, where fellows learn how to communicate science to non-technical audiences, draft compelling blog posts, engage stakeholders in the research process, and prepare high quality research proposals and budgets. The PARR program is managed and coordinated by START, with funding provided by the United States National Science Foundation and the Oscar M. Lopez Center. The PARR Alliance, a consortium of science-focused research, education, and capacity building institutions in Asia, provide strategic direction for PARR, with many institutions actively participating as host institutions. An editorially independent, non-profit magazine, ProSus is published twice a year by START International.